Alright!, so as promised here are the Week #1 results. Here is how the individual members schedule & results look, I'll only post one here (@emmett kelly) since it would be way too many to post all 8. And finally, here is a look at the standings after Week #1. So, that's pretty much how this league challenge would look and work. Curios to hear everyone's thoughts on this format. You guys like? Or not so much. So, I guess we can attempt to run another week of this (Week #2) if you guys are interested? Here are the Week #2 match-ups. 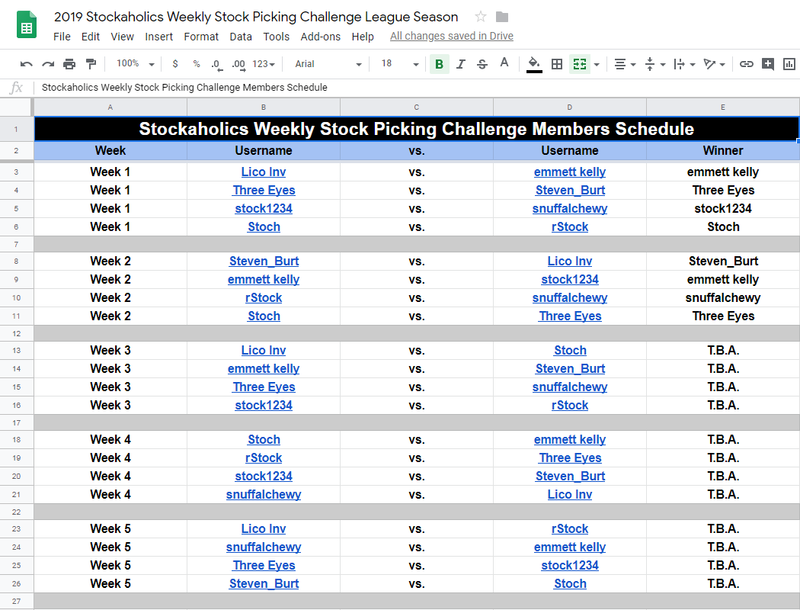 The reason I am running this apart from our regular weekly picks contest is so that I don't have to input everyone's picks in manually since I'm doing them via the Google form. And also this gives everyone an opportunity to select different picks from the regular weekly contest if they so choose. GLTA in this Week #2 of the league challenge! Yes! Always up for a challenge. Looks like there were no weekly picks from @snuffalchewy for this week, so as was posted in the "rules" we will just carry over his weekly picks from last week to this week. Hmm, it looks like quite a few of our participants are either not aware of this league format or are maybe not overly interested. 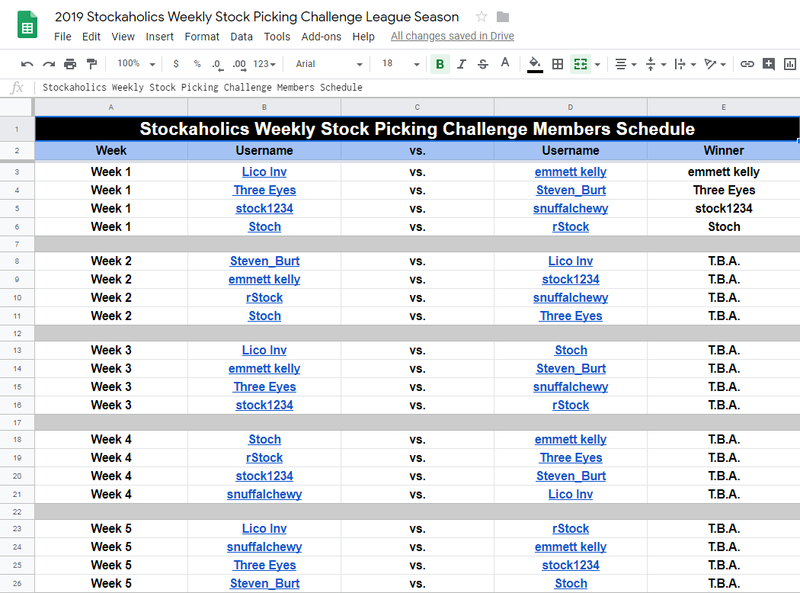 FWIW, I've been having to manually add members picks in from our regular weekly thread into the spreadsheets, and admittedly that defeats the purpose of having the Google forms setup in here. Thus, I might have to cut this league format short, and maybe end it after this week. I know I said the same thing last week as well, but I ended up running this another week. I guess I'll just play it by ear after the end of this week and see how it goes. I do still like to give this league format a full run w/o interruption at some point in the year if it isn't right now, but I do understand that we have quite a few other competitions going on for us right now, and I guess that's getting a little overwhelming for some of you guys haha. We're also going to be having the community challenge starting up very soon as well. Anyway, again, I'll see how it goes by week's end. Perhaps what I could try to aim for here is a 4-week season instead of the 8 that I had scheduled. Or, we can just try again some other time later on in the year when we don't have so many other competitions going on at the same time lol. It would be cool if it caught on---I think it's an intriguing contest idea. But nobody could blame you if the contest had to be put on hold if its adding extra work to maintain it manually without the Google Forms being used. Please Close EAT 41.72 11:21 ET - Thanks! Please Close X 22.73 @ 2:48 ET - Thanks! That said, I'm gonna see if I can still continue to run this, even despite the Google Forms not being used from at least half the participants. I can just play it by week, and if at any point the workload seems to be too overwhelming because of maintaining this manually then I'll just put it on hold. What I can maybe do here that might myself a little is to setup the following week's match-up's and forms/spreadsheets so I don't have to worry about doing them on the weekends. Then I just bump that post on Friday night when I'm updating all of the other competitions. I think that should work. We'll see. To save myself some time here so I don't have to do these over the weekends, I'm going to post the following week's match-ups (forms and spreadsheets) right now and then just bump this post on Friday night or Saturday morning or whenever I update all of our other contests. I think this should work out and we'll be able to run this league challenge to its completion. We'll see. Here are the Week #3 (Week of 2/4-2/8) match-ups. ^^ Nevermind! The update wasn't quite as bad as I thought. Here are the Week #2 results! And finally, here is a look at the standings after Week #2. And just a reminder that the Week #3 Google Forms and spredsheet links have been posted on Post #33 here in case you guys are looking around for them! And I'm once again having to copy over @snuffalchewy's picks from last week as he has been MIA from the weeklies for a couple of weeks now. @snuffalchewy, are you still in the game? So, I really hate to do this to the few of you who have been taking the time to submit your picks via the Google Forms in here during these past couple of weeks, but unfortunately about 60% of the participants actually did not submit their weekly picks via the google forms in this contest for this week, and I actually had to do them manually by copying weekly picks from our regular weekly contest, which admittedly was a bit of a pain in the rear for me lol. Thus, I think I am going to just go ahead and call this thing off indefinitely until further notice. Yes, I know I have been going back and forth on this decision for the the past couple of weeks now where I've been very close to calling things off, but then later reversed course and decided to continue running it. But, I think this time I am going to carry out on this decision. I just don't think this is fair to those folks who have been taking the time to submit picks via the forms, vs. those who haven't. Additionally, we have one participant here who hasn't even submitted weekly picks for the past couple of weeks now. It just seems kind of ridiculous to keep carrying over and repeating old weekly picks every new week. It just makes perfect sense to not run this right now, until we have the proper participation. The next time I launch this, I will make sure that the people who are participating will be around for the duration of the contest so we don't have these instances where one participant isn't even around for weeks at a time. I do think this league format is a cool idea for a contest personally and I enjoy running it, but this might be bettered served to run when we don't have a gazillion other competitions going on at the same time. I could be wrong, but I think that's largely the reason why this league format hasn't really gained as much traction as you would think. I believe it's mainly because we just have way too many other competitions going on at the same time, and it's either confusing or overwhelming some people haha.